Lobo comes to Earth and immediately begins tearing up Metropolis as he carries out a job he took from some scuzzer from Thanagar. Superman tries to reason with the alien but that doesn't work and the fight begins. It takes everything the Man of Steel has but he is finally able to knock Lobo off the planet before he collapses. Later he is in the hospital and Lois comes to visit him. He is there as Clark not Superman and she tells him that she loves him. She lays on his chest and asks him what happens now. Story - 3: It took seven issues but it finally hit me. The answer to the question, "Why didn't I like this series beyond the first issue?" 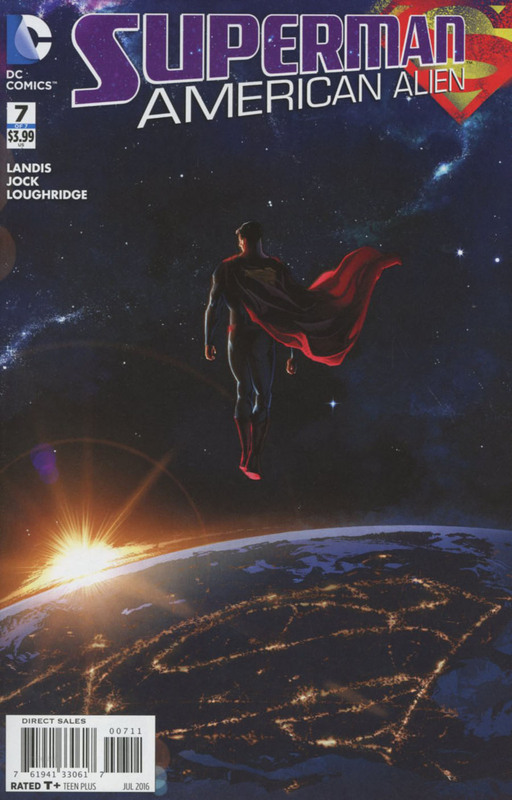 This series was for a newer reader or a reader that was more open to seeing Superman's early days explored in a modern context from a more introspective standpoint. So all of my problems with this final issue are kind of moot. I am not the audience for Landis' dialogue, which tries to be amusing as well as hard hitting. The conversation between Superman and Lobo where Lobo asks why Superman is trying to protect dead people is meant to be funny and to some it probably was. Just not me. The whole thing with Clark talking to Jimmy at the beginning about Lois leaving before he wakes up was meant to humanize the character and make him more relatable but it just didn't hit me that way. To me it came off as trying to be edgy and failing. The only scene I got anything out of was the final one and even that fell flat. I mean how obvious can you be with having the last line of dialogue be, "What happens now?" This issue was the end to an independent style Superman film and I just wasn't in the mood for that. One criticism that has nothing to do with style was Landis' assertion that this was going to be the most brutal Superman fight ever. It wasn't. The fight with Doomsday in 1992 was much more brutal and destructive than this. That was in Superman #75, by the way. Some people might tell you Action Comics #75 but they would be wrong. I feel confident in that complaint. Otherwise I hope that if you liked this series that you liked this last issue. I'm just glad it's over. Art - 2: This art did not match the story at all. I'm sure the creative people thought so but Jock has a very specific style and to my mind it does not fit with this epic throw down that takes up the majority of the issue. I also hate the costume design, which looks like a Superman costume a professional BMX bike rider would wear. Why does Superman need padding of any kind? The design is way too busy and does nothing for me. 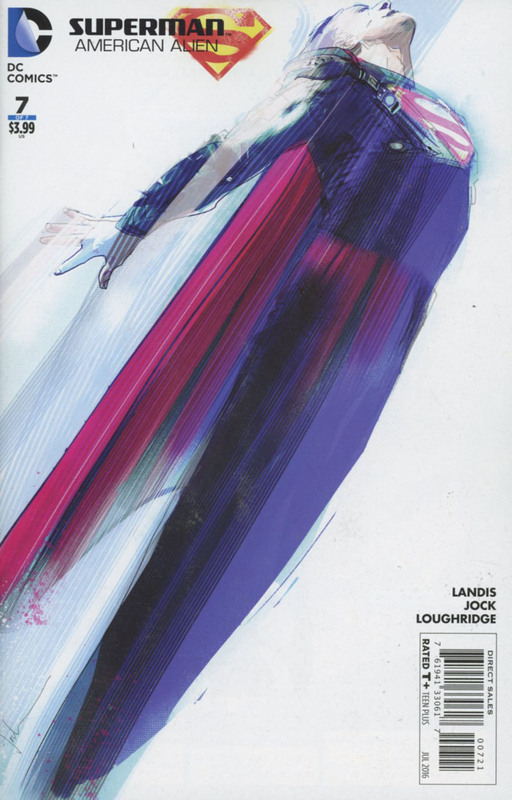 The art was a real let down and I feel that if they had gone with someone with a slicker, more illustrative style I would have enjoyed the issue more. I'm not saying that Jock is a bad artist. I am saying that he was the wrong choice for this issue. Cover Art - 5: This is a really nice cover. I am sure it's not an accident that this image is very reminiscent of the scene in SUPERMAN RETURNS where Superman is hovering above the Earth. The S symbol in the lights of the world below Superman was a nice touch. This was my favorite part of the entire issue. Variant Cover Art - 4: This cover was fine. It was nothing special and had an Alex Ross feel to it. I neither liked it nor hated it.